Bárðarbunga Volcanic System, a pre-publication extract from the Catalogue of Icelandic Volcanoes, to be made publically available in the coming months. Web-cameras from M&T ehf are watching the area in various directions. Web-camera from Míla is watching Holuhraun where a small lava eruption took place. Please observe that Míla’s background photo has nothing to do with the current events. Scientists from the Icelandic Met Office and the Institute of Earth Sciences and representatives of the Civil Protection in Iceland attend the meetings of the Scientific Advisory Board of the Icelandic Civil Protection. 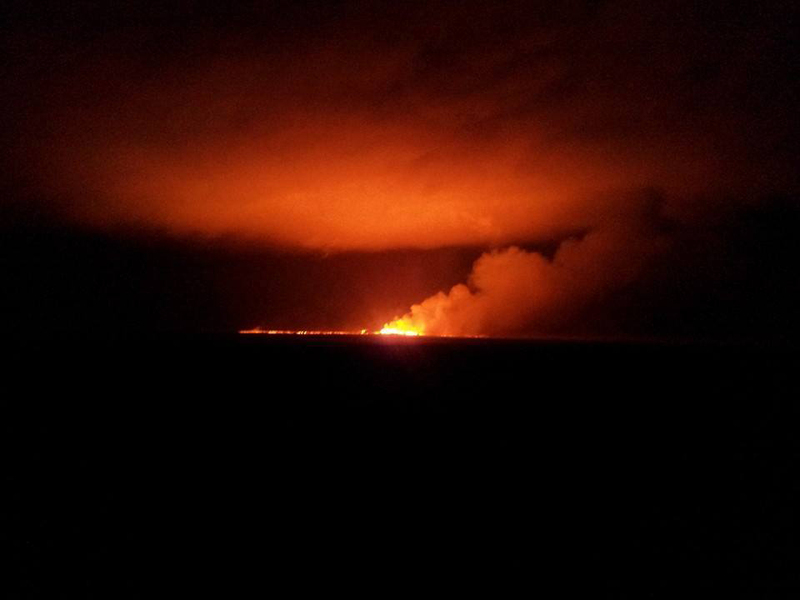 · The lava eruption on Holuhraun continues. Lava flows northward from the eruption site. · At 13:00 UTC today, an overflight will be made over Holuhraun and north-west Vatnajökull with scientists from the Icelandic Meteorological Office and the University of Iceland, together with a representative from the Icelandic Civil Protection. Observations from this flight will be reported in later briefings. · At 20:00 UTC yesterday, the lava extended over a 3-km-area. This corresponds to a magma discharge of 300 to 500 cubic metres per second. From observations yesterday evening, the volume of erupted lava is between 16 and 25 million cubic metres. · The eruption has not created any ash-fall. · Gas and steam rises to a couple of hundred metres above the eruption site, extending up to 1,200 m downwind. · In connection with the FUTUREVOLC project, a gas monitoring station has been set-up near to the eruption site. Gas measurements indicate a high level of sulphur dioxide. People could be exposed to highly dangerous gas levels close to the eruption. It is essential that those visiting the eruption site are equipped with gas sensors and gas masks. · According to the latest GPS observations, horizontal ground movements continue in response to the dyke intrusion. There is no clear sign of a pressure decrease in the dyke intrusion in connection with the ongoing eruption, although there are irregularities in GPS displacements at nearby stations. The northern extent of the dyke intrusion has not changed to any great extent. · When Sunday’s eruption began earthquake activity decreased somewhat, although seismicity remains high, with over 500 earthquakes detected since midnight today. Most of the seismicity is occurring on the northern end of the dyke intrusion, covering a 15-km-long region that extends partly beneath Dyngjujökull and north of the ice margin. · At 08:58 UTC today, a magnitude 5.0 earthquake was recorded on the Bárðarbunga caldera, and another of magnitude 5.2 at 11:41 UTC in the same region. o The migration of magma could stop, resulting in a gradual reduction in seismic activity and no further eruptions. o The dike could reach the Earth’s surface causing another eruption, possibly on a new fissure. Lava flow and (or) explosive activity cannot be excluded. o The intrusion reaches the surface and another eruption occurs where either the fissure is partly or entirely beneath Dyngjujökull. This would most likely produce a flood in Jökulsá á Fjöllum and perhaps explosive, ash-producing activity. o An eruption in Bárðarbunga. The eruption could cause an outburst flood and possibly an explosive, ash-producing activity. In the event of a subglacial eruption, it is most likely that flooding would affect Jökulsá á Fjöllum. However it is not possible to exclude the following flood paths: Skjálfandafljót, Kaldakvísl, Skaftá and Grímsvötn. · Other scenarios cannot be excluded. The Aviation Colour Code for Bárðarbunga remains at ‘orange’ and the code for Askja at ‘yellow’. Around 250 earthquakes have been automatically detected until now. Most of them are located in the northern part of the magma intrusion, between the eruption site and south to about 10 km into Dynjujökull. Strongest events were up to around magnitude 2. The rate of events has decreased as a result of pressure release due to the eruption, but there is still ongoing continuous seismicity. Several events have occurred around the Bárðarbunga caldera rim, strongest events were M4.2 at 03:09 on the southern rim and M4.5 at 04:59 on the northern rim. See maps. In the broader Askja region, most events were located at Herðubreiðartögl, the strongest event there was M2.9 at 02:56. This area is a quite common place for seismic activity, the activity now is not necessarily caused by increased stress due to the intrusion (the tip of the intrusion is about 25 km SW of this cluster). Askja volcano itself was seismically quiet last night.